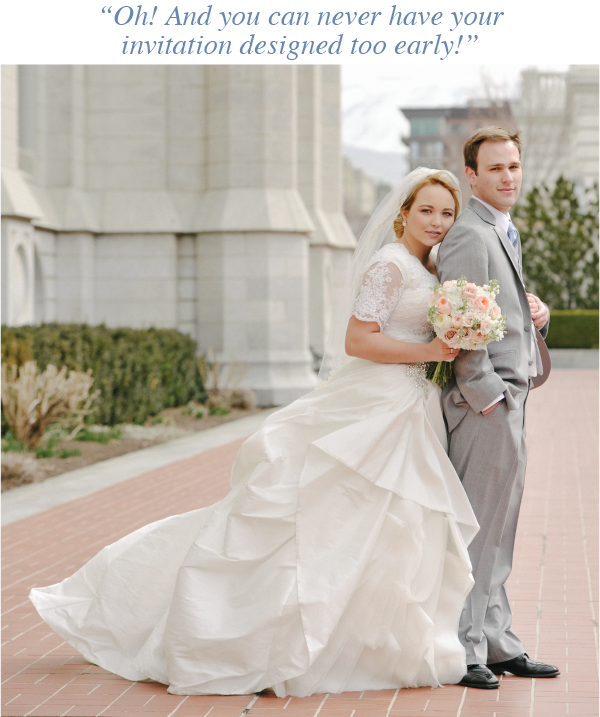 Congratulations Chandler Huntsman-Astin our July Bride of the Month! 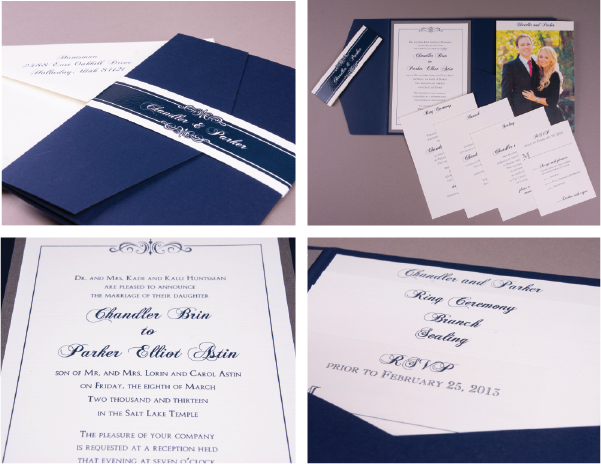 This month we are featuring Chandler Hutsman-Astin and her Classic Navy and Ivory invitation suite. Her simple but classic taste was shown throughout her wedding details along with her choice on using thermography that made her invitations look complete! Chandler: Yes I have, but I can tell you one thing; one wedding is more than enough. I could never do that professionally! Interviewer: I absolutely love how your invitations turned out they were so elegant and well put together with the layers and pocket to keep all the details organized. Tell me about the process you went through in dreaming up your invitations. 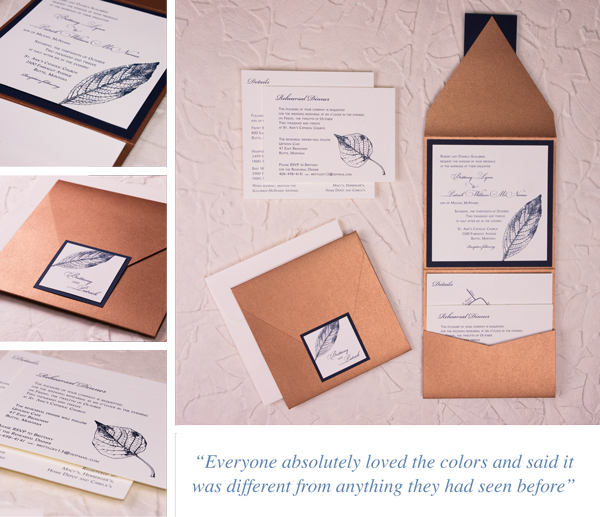 Where did you get your inspiration from and how did you decide on what your invitations would look like? Chandler: I actually went out and got a couple of bridal magazines with my Mom after I got engaged. I went through page-by-page and have a binder full of pages I tore out in search of great ideas. I had my basic idea and showed it to my Mother and my wedding planner. Between the three of us we explained what we wanted to Ann Elizabeth. After that we came up with some rough drafts and I ran everything through my husband, in-laws and parents and with everyone’s combined effort we came up with exactly what we wanted. I couldn’t have done it without the artistic design and help from Ann Elizabeth, I knew what I wanted, but I never would have been able to get there on my own. Chandler: Everyone loved the overall elegance, but I think the number one compliment we got was how everything just fit together so nicely. The layered invitations on the right made everything clear and prevented things from getting lost or cluttered. 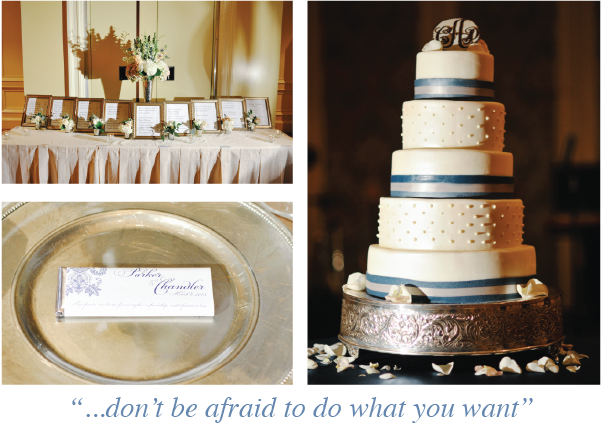 Chandler: I actually used the lettering to inspire my seating assignments, table numbers and the monogram I had on my cake, and the chocolates I had made for my dinner guests. Chandler: I think when people opened the invitations they got a sense of what to expect on the day of our wedding. From the moment people opened them they realized this would be a little different from the typical wedding we see here in Utah. While those are beautiful, I am very traditional and I always pictured having a less modern style wedding that captured the old elegance that we sometimes lose. Our friends and family still comment on how the simple, clean elegance of the invitations perfectly captured the event we had. Chandler: Have an idea of what you want, start looking through every magazine you can find, be open to new ideas and don’t be afraid to do what you want. I know my wedding was a little “old fashioned” and my invitations were “old school” but that is what we wanted and it perfectly captured our marriage. Chandler: Don’t get too caught up in one thing or another; remember the process as a whole will spit out the perfect design, one aspect will not make or break your invitation. Oh! And you can never have your invitation designed too early! Chandler: It was great! I was worried it would be hard to get my ideas across but they were able to perfectly capture what I was hoping for and the invitation they came up with was better than anything I had dreamed of. Interviewer: Chandler thanks for taking the time to talk with us and share the details of your wedding!